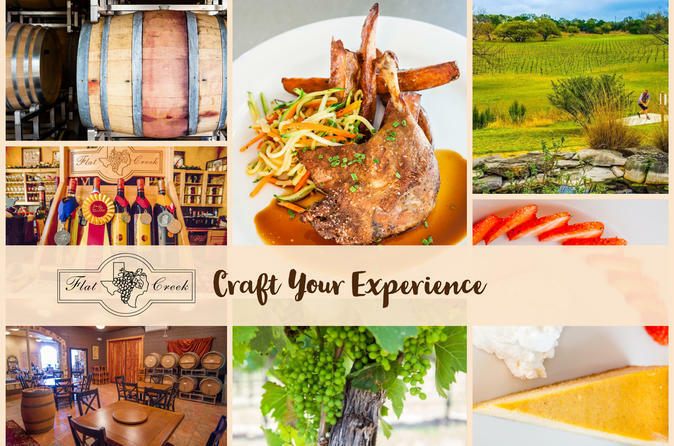 Flat Creek Estate Winery & Vineyard invites you to enjoy our full array of experiences at a discounted rate! Your Flat Creek Estate Experiences Annual Pass entitles the main traveler and three additional guests to experience a complimentary seated educational wine tasting at our beautiful Texas Hill Country vineyard estate. This benefit extends for one year from date of purchase with unlimited visits to the vineyard. In addition to a year of complimentary wine tastings, you will also receive discounted rates on special event tickets including barrel tastings, wine and food pairing classes, black glass tastings and more! Plus, every time you purchase a bottle of wine at any of our locations, you'll receive a 20% discount on the wine! This includes our vineyard Tasting Room, on-site restaurant The Bistro, or our sister wine bar Flat Creek Enoteca. Visit Us at Our Texas Hill Country Estate Tuesday - Sunday (11am - 5pm) to Pick-Up your Flat Creek Estate Experiences Annual Pass. Spend the year experiencing what Texas wine is all about!